INDIANAPOLIS — IUPUI biologists are growing 'mini retinas' in the lab from stem cells to mimic the growth of the human retina. The researchers hope to use the research to restore sight when critical connections between the eye and the brain are damaged. These models also allow the researchers to better understand how cells in the retina develop and are organized. These results are published online in Scientific Reports, a Nature Research journal. The lab-created mini retinas, called retinal organoids, are collections of cells that grow in a manner similar to how the retina develops in the body. The retinal organoids are created in an IUPUI biology department research lab using human pluripotent stem cells, or hPSCs, which can be derived from adult skin cells. Jason Meyer, an associate professor of biology in the School of Science at IUPUI, is using the retinal organoids to better understand retinal ganglion cells, or RGCs, which provide the connection between the eye and the brain. 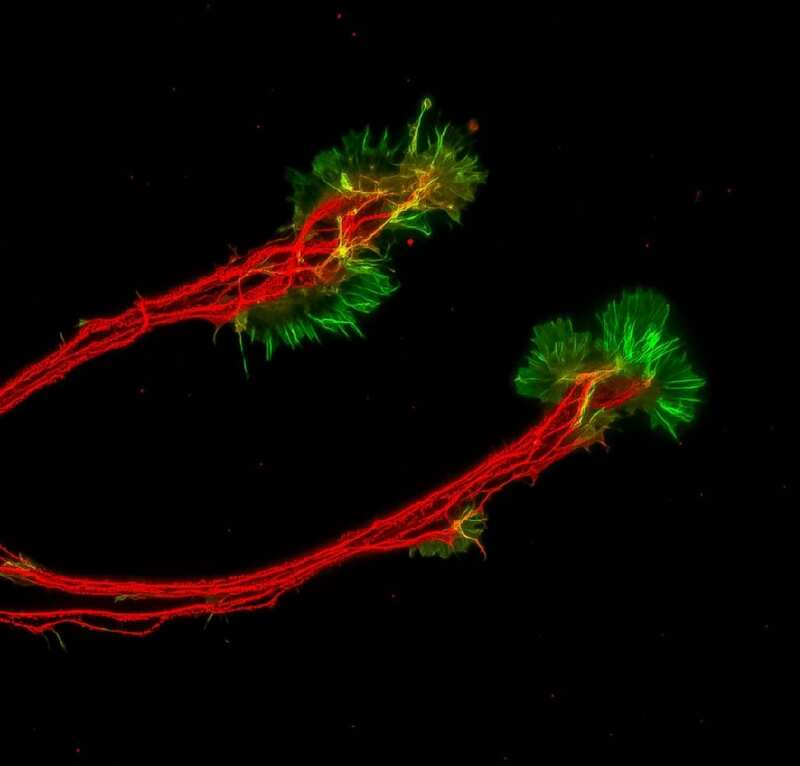 These cells project long axons to transmit visual information. When that connection is disturbed, a person loses sight. "In the past couple of years, retinal organoids have become a focus in the research community," Meyer said. "However, there hasn't really been any emphasis on those retinal ganglion cells within these mini retinas, the retinal organoids, so this study is not only looking at how the retinal organoids develop and organize but also exploring the long axons they need in order to connect with the brain." RGCs are the cells primarily damaged by glaucoma, a disease that affects about 70 million people worldwide and is the second leading cause of blindness. "There's a lot we have to understand about these cells outside of the body before we can put them into humans for transplants and treating those diseases," said Clarisse Fligor, a biology graduate researcher and first author on the paper. "This research is looking at ways that we can encourage growth of these cells for possible cell-replacement therapies to treat these different injuries or diseases." Fligor looked through different growth factors involved in RGC development and found that a protein called Netrin-1 significantly increased the outgrowth of axons from these cells. "This protein is not expressed long term; it is most prominently during early human development," Meyer said. "Once the retina is established, it's not as available, which is why retinal ganglion cells usually can't fix themselves. Strategies so far to replace retinal ganglion cells by transplanting new cells have not been able to restore those connections because the body itself doesn't produce these signals." The researchers hope this study is an important step toward using lab-grown cells for cell-replacement purposes. "If we want to be able to use these cells for therapies and encourage the proper wiring of these cells within the rest of the nervous system, perhaps we need to take a page out of the playbook of human development and try to re-create some of those features ordinarily found during early human development," Meyer said. "Three-Dimensional Retinal Organoids Facilitate the Investigation of Retinal Ganglion Cell Development, Organization and Neurite Outgrowth from Human Pluripotent Stem Cells" is published online in Scientific Reports, a Nature Research journal. In addition to Fligor and Meyer, IUPUI and Indiana University authors on the study are Kirstin B. Langer, Akshayalakshmi Sridhar, Priya K. Shields, Michael C. Edler, Sarah K. Ohlemacher and Chi Zhang. Other authors are Daniel M. Suter and Yuan Ren of Purdue University and Valentin M. Sluch and Donald J. Zack of Johns Hopkins University. The study was supported in part by the National Eye Institute, the National Science Foundation, and the Indiana Department of Health Spinal Cord and Brain Injury Research Fund. The School of Science at IUPUI is committed to excellence in teaching, research and service in the biological, physical, computational, behavioral and mathematical sciences. The school is dedicated to being a leading resource for interdisciplinary research and science education in support of Indiana's effort to expand and diversify its economy.